Costantino Iadecola, M.D., an expert in the molecular pathology of ischemic brain injury and neurodegeneration at Weill Cornell Medical College in New York, will present the 10th annual Meredith S. and John A. Oates Lectureship in Clinical Pharmacology on Nov. 3. His lecture, entitled “Bright and dark sides of immunity in stroke and dementia: the gut takes center stage,” will be given during Medicine Grand Rounds at 8 a.m. in room 208 Light Hall. Iadecola is the Anne Parrish Titzell Professor of Neurology and director of the Feil Family Brain and Mind Research Institute at Weill Cornell Medical College. His lab is investigating interactions between cardiovascular risk factors, stroke, vascular dementia and Alzheimer’s disease. 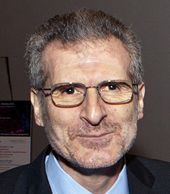 The author of more than 290 journal articles, Iadecola has received several national awards for his research, and he plays a leadership role in national and international networks for stroke and dementia research. The Oates lecture is named for John Oates, M.D., the Thomas F. Frist Sr. Professor of Medicine, professor of Pharmacology and founding director of the Division of Clinical Pharmacology, and his wife, Meredith.